« How To Start Your Own Back Garden Nursery – New Video! For the mist system: do you always combine the mist system with a polytunnel or is the bed simply in the open? 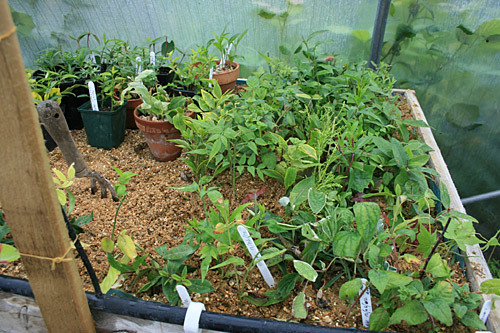 Are your propagation beds in shade? For seeds I have on in full sun one in shade for different kind of plants. For the compost: we never have enough compost, can I replace it with aged cow manure? My mist system is outside. I used to have my cutting bench in the polytunnel but found it wasn’t necessary and it became a problem when the sun was particularly strong. This year my cuttings are all outside and seem to have rooted just fine. My cutting beds are in the shade which is particularly important when you first take the cuttings as you need to keep them moist if you’re to increase your chances of success. I tend to use well rotted cow manure in my open beds, but never in my potting compost. Potting compost needs to be light and well drained and easy on the fertiliser. I add a teaspoon full of slow release fertiliser to a 5 inch pot when I pot up my cuttings, but if you’re not sure, less is always better than too much. Good luck with your new venture and if we can help with any more advice don’t hesitate to ask. I actually liked all your videos so far. 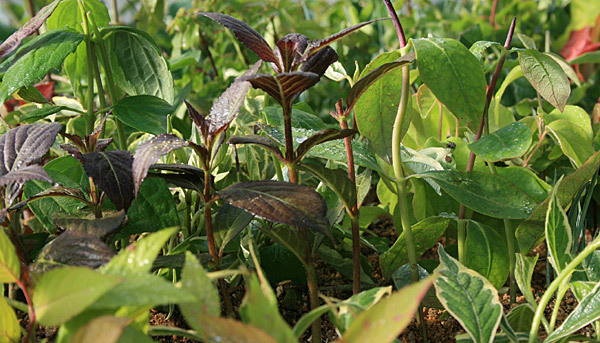 I think there are many people who want to propagate plants to sell and there are many many questions worth discussing. I really miss an internet forum to discuss such a venture. I.e. would you sell your roses from cuttings knowing that they are usually grafted? Or what tags do you use on your plants? Do your neighbours and friends get everything for free (difficult to charge someone in a small town)? I could go on here…. Forum sounds like a great idea … I’ll look into it. I don’t plan to sell my roses as I can’t guarantee they will remain pure to the original. I use tie on wooden tags as I like to keep it as organic as possible. Have been reading your instructions. I plan to make a small misting bed inside my greenhouse. I note yours is outside. Should they be outside? Is that to avoid overheating? Secondly, I see you have your timer on the main water area. What do you need to do, though, when you want to use the secondary hose? 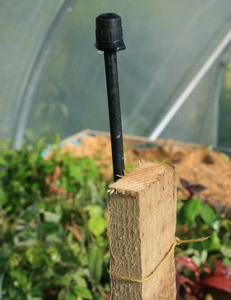 I have a “four way” at my main outside tap that runs hosing throughout the garden, one hose runs into the greenhouse. 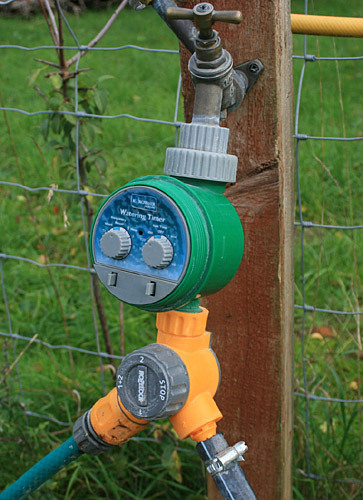 If I put the timer at the main outside tap, as you have done, does that mean I would have to over-ride it constantly when I want to use the other hoses? 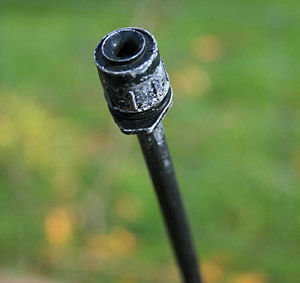 Have you tried putting a small pump inside a waterbarrel by any chance? and using rain water? Thank you for all of your information. Good to hear from you Aileen. We have our mist bed outside as it gets very hot in the polytunnel and providing you keep the atmosphere around the cuttings moist they’ll root just fine outside. “I see you have your timer on the main water area.” Yes. We have a second hose with it’s own supply that we use for general use. 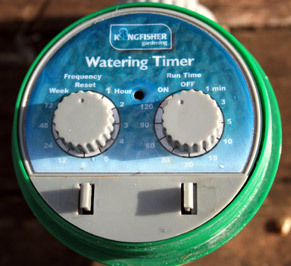 This year we’ve also installed a dedicated water supply that is connected to the main water supply which means we can split the supply further and we won’t lose pressure. Before we had the additional water line we used a split connector like you and switched the timer off until we finished watering, then simple put if back on for the mist unit. I haven’t tried a pump and rainwater yet, but we are about to acquire two large 1000 ltr tanks which should mean we can hook up a small pump and save some cash.